A woman holds a sign at a rally and lobby day organized by the Maine Peoples Alliance at the State House in Augusta, Jan. 8, 2014. 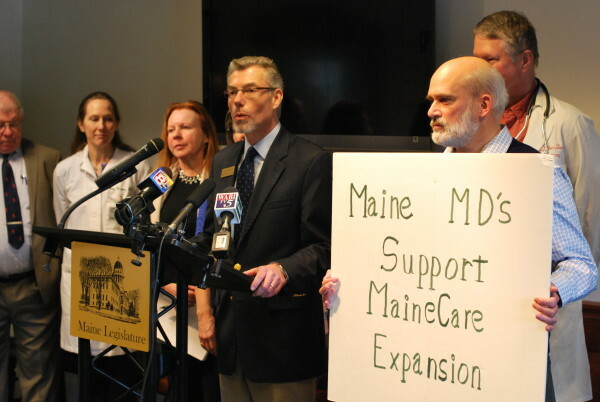 Andrew MacLean, deputy executive vice president of the Maine Medical Association, voices his organization's support for Medicaid expansion at the State House Welcome Center in Augusta, Jan. 23, 2014. AUGUSTA, Maine — Proponents of expanding Medicaid in Maine under the provisions of the federal Affordable Care Act will deliver more than 66,000 signatures to the secretary of state’s office Wednesday. The signatures, if at least 61,123 of them are certified to be from registered Maine voters, will force a statewide referendum on the issue, likely later this year. Medicaid expansion under the provisions of the Affordable Care Act, also known as Obamacare, has been tried and failed numerous times in the Legislature in recent years and has been successfully vetoed by Republican Gov. Paul LePage six times. 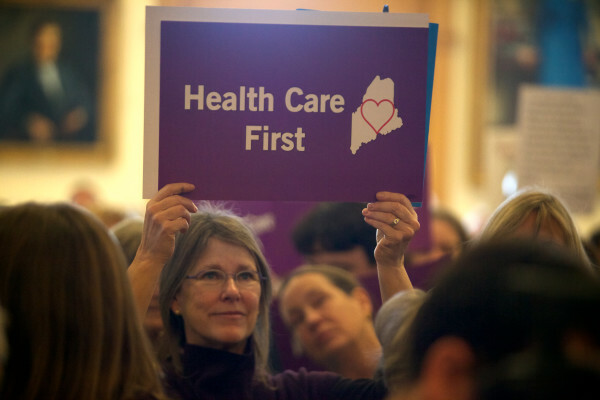 While LePage and others argue that expansion would be devastating to the state budget in future years, proponents focus on the additional federal funding that would come to Maine under expansion to provide health care coverage for more than 70,000 Mainers. As of Jan. 1, a total of 31 states and the District of Columbia had adopted some form of Medicaid expansion, according to the Kaiser Family Foundation. Running parallel with the effort at a citizen-initiated referendum are efforts by President Donald Trump and several members of Congress to repeal and replace the Affordable Care Act. It’s unclear how those efforts would affect the referendum in Maine.